Many dating sites will sell you on fun and games for high premiums only for you to realize you’re still not meeting anyone worthwhile. That’s where EliteSingles steps in, offering a strong alternative to sophisticated and mature daters. Ranging from members in their 20’s to those 50+, EliteSingles understands that being serious about dating isn’t about age as much as finding the right person to begin sharing experiences with. If you’re in that boat, EliteSingles was designed with your interests in mind..
EliteSingles uses staggered subscriptions which cost less with longer you sign up for. The company offers two premium options in addition to its free basic membership: EliteSingles Premium. EliteSingles removes the distracting features other dating sites offer in favor of a cleaner, more formal approach. The profile search is beyond efficient and is based on the criteria you provided during your personality test (which you’re able to modify at any time). Check out your “Profile visitors” while viewing your matches to see who’s been checking you out, or click “Communication Status” to see where your last conversation left off. This is ideal for busy singles with work life and other goals on their minds. While signup is free, you will need to sign up for a premium account to unlock everything EliteSingles has to offer. 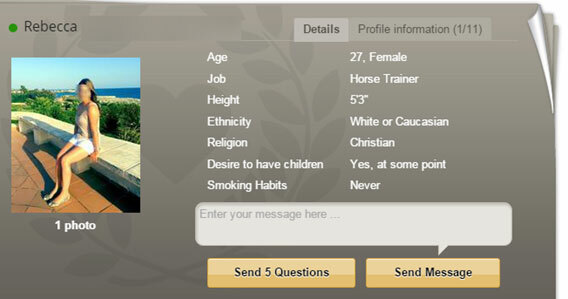 For example, premium members have access to 20 profile introductions, accessible immediately within the “Matches” interface. The introductions are based off your personality test results, saving you a lot of initial time warming up to other EliteSingles members. After initial signup – which is incredibly simple, only requiring you to input your email address and password –you will be prompted to complete a comprehensive personality test. The list of questions analyzes 29 unique personality traits to help aggregate the best list of matches from an attractive pool of singles. While the test will take you about 20 minutes to complete, albeit a significant amount of time to set aside in a busy day, it shows the company’s dedication to creating an authentic, no-frills dating experience. Still, understanding that most EliteSingles members are working professionals, the site does give you the option to save your progress and complete the test at a later time. Once the test is complete, you will then be taken to your dating profile where you can spend time polishing certain details before checking out matches and sending messages to other singles. Note: You’ll gain more attention and increase communication by verifying your identity. All that’s required is that you send a current photo of yourself, and the front and back of a legal identification card, to the EliteSingles customer service team – and once you’re verified, your ID Verified Member Badge will display on your profile. The entire process is beautifully outlined and easy to follow. There’s an icon in the form of a lightbulb that pops up as you make your way around your profile, explaining how things work and guiding you along your way. Find out who has viewed your profile. We have worked hard to create a conscientious, professional dating site where American singles of all ages can feel free to focus on finding love. To this end, we are dedicated to making sure we always treat your personal information with the highest confidentiality: your privacy is our priority. Our Customer Care team vets all new dating profiles to confirm authenticity, and we employ ID Authentication, Manual Profile Verification, SSL Encryption and Fraud Detection Systems as standard, ensuring that, when you join our dating service, your data is safe with us.